Glass is one of the most versatile and attractive building materials used in projects ranging from small commercial buildings to huge skyscrapers. In the typical modern city, glass is everywhere the eye can see. 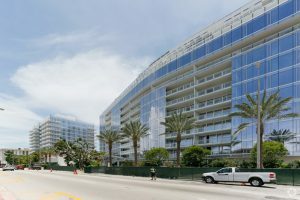 Have you ever wondered how building owners and contractors protect all of this glass from construction that is going on in its immediate vicinity? Not to mention how owners shield it from the moisture of precipitation, the harmful UV rays from the sun and the harsh effects of grit and pollution in the atmosphere. Over time, exposure to natural and human-made factors can ruin the way exposed glass looks and can degrade the value of the entire structure. Window glass protective coatings exist to shield glass from the harmful effects of construction debris and other factors that can damage the appearance of glass. Applying a protective coating to a skyscraper is no easy task. In the past, adhesive films represented the only feasible way of protecting glass, but this method came with its fair share of problems. For one, the adhesive films tended to peel away from the glass as the adhesive that kept them in place deteriorated. The frequency with which owners had to remove and replace the adhesive films reduced any cost-effectiveness realized from this method of glass shielding. One way to guard against the harmful effects of outdoors on glass surfaces is the application of liquid window glass protective coatings. Manufacturers have developed this newer method for technicians to be able to roll or spray onto glass making it much easier to apply to almost any type of building. The coating dries and forms a durable protective film that can withstand any harsh environment. This type of coating is not permanent, with the best of them guaranteed to last up to three years, but they do represent a better solution than what was available in the recent past. Taking into account the ability of these products to go on relatively quickly and keep exterior glass looking its best, they may well prove worth the investment.